I somehow managed to delete the ‘classic’ photo I took looking across the lawn to the swing, so thought I’d start with the shady bed for a change. This is the location of the Sarcococca (on the left) which I snipped for my scented Monday vase. 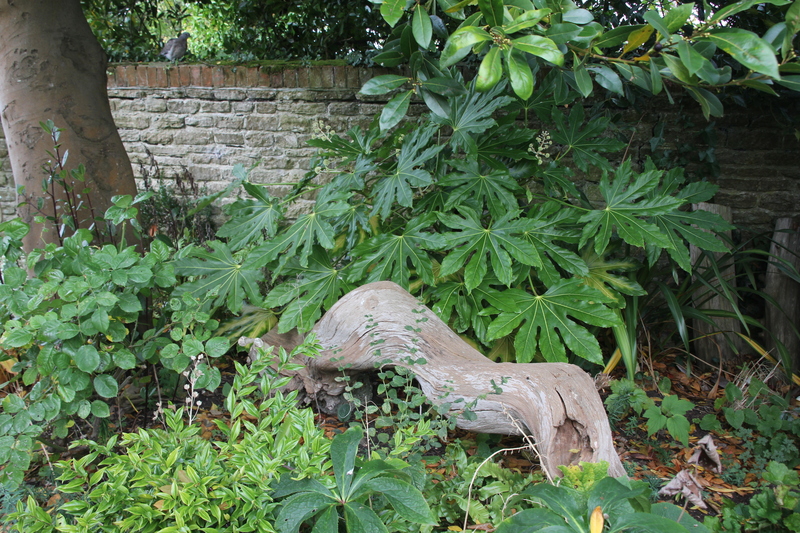 There’s a lovely dark hellebore here too, towards the centre of the photo, but it’s not yet open. Another ‘spring thing’ to look forward to! In the troughs the stocks, which were grown from cuttings and planted out last year, are finally starting to make their mark and will hopefully also provide scent later in the year. In front of them plenty of daffodils are just peeping above the parapet. The grand plan for this bed later in the year is to have a mass planting of Pelargoniums as I think they’re about the only thing I can think of that will tolerate the heat and dryness of these metal troughs in the summer. 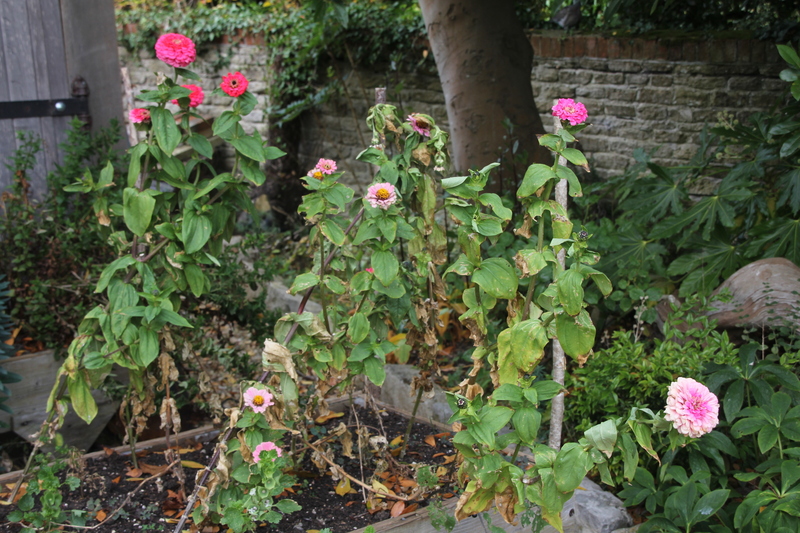 The Swing Beds are still pretty green but definitely in need of a tidy – particularly those roses. I’m going to need to be feeling strong for them! The swing itself has a rather charming ‘fringe’ of Clematis cirrhosa ‘Freckles’ on the right hand side. Sadly, the one on the left seems to have disappeared. The right hand Swing Bed is looking as dull as the left one, but with a similarly scary looking rambling rose. Now where are those gauntlets…. Happily, in the robustly defended Grass Bed, the bulbs are coming up unmolested. 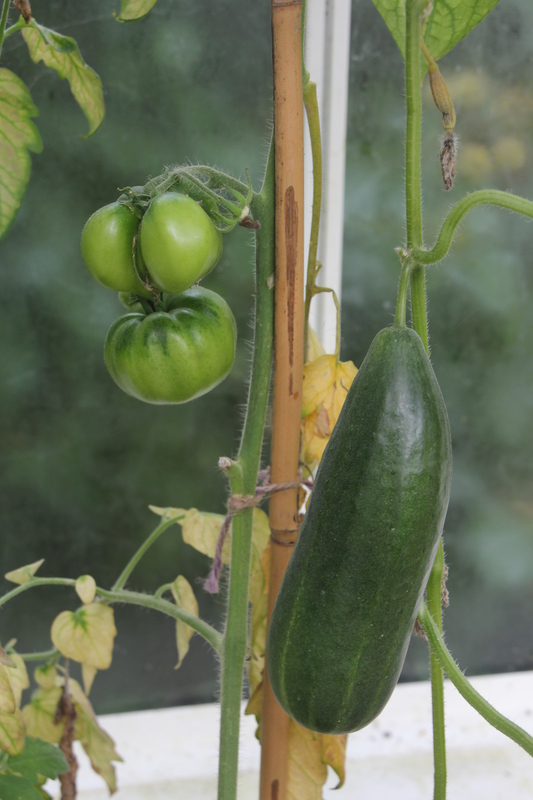 At some stage – once I’m confident they’re beyond being eaten but preferably before all the buds have formed – I’ll need to remove the chicken wire so we can enjoy them. Meanwhile, I’m a worried the Stipa tenuissima are looking a bit peaky. I normally have a bit of a divide/replant over winter to try to maintain the row, but there’s not much material to work with! Looking across the Mid Century bed towards the greenhouse you can still see the big white sacks of compost and manure delivered before Christmas. I have done some sh*t shovelling, but the weather has been so rubbish that reading a gardening magazine by the warmth of the Aga has been rather more appealing. In the metal bath by the front steps the Osteospermums are still flowering. I did try to take some cuttings but they didn’t take. Perhaps I’ll try again in the spring as I do love this colour. Further round, the Hamamelis is looking good – it probably deserves neater environs, so that’s another bed that needs a tidy and mulch. The Bronze Bed is already showing signs of the (hopefully) bonanza of bulbs to come. For the last two years there have almost been too many, but I’m not complaining! whilst in the greenhouse there are lots of Perlargonium cuttings coming on, as well as a few bought ones from Derry Watkin’s nursery which I visited when we went to Bath. 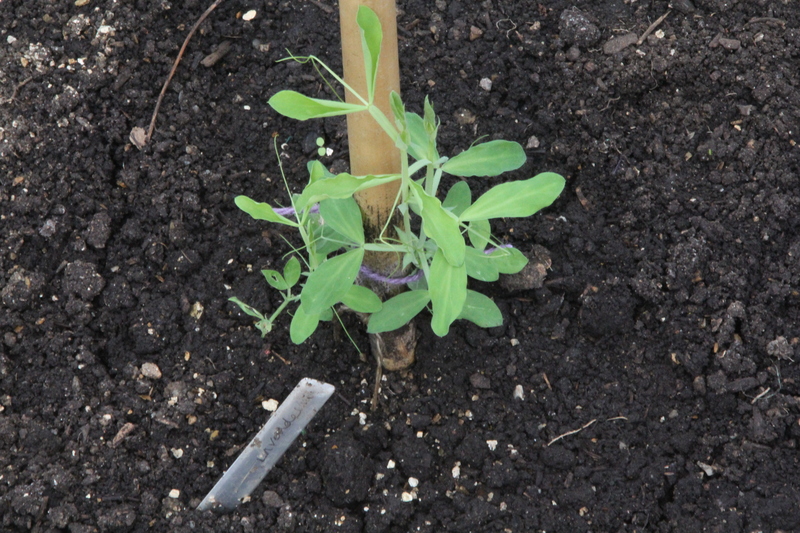 In addition, here is the first wave of sweet peas – these are the ‘Winter Sunshine’ variety that last year flowered in April. And to finish, yet more bulbs to look forward to. Roll on spring! With thanks to Helen at the Patient Gardener for hosting EoMVs. This entry was posted in End of month view, Garden and tagged Hamamelis Arnold's Promise, Osteospermum Serenity Rose Magic, Sarcococca confusa on January 31, 2018 by jenhumm116. Happily, not only did I not succumb to the flu, but my three family ‘sicknotes’ are all recovered, hence part of the reason for the title. 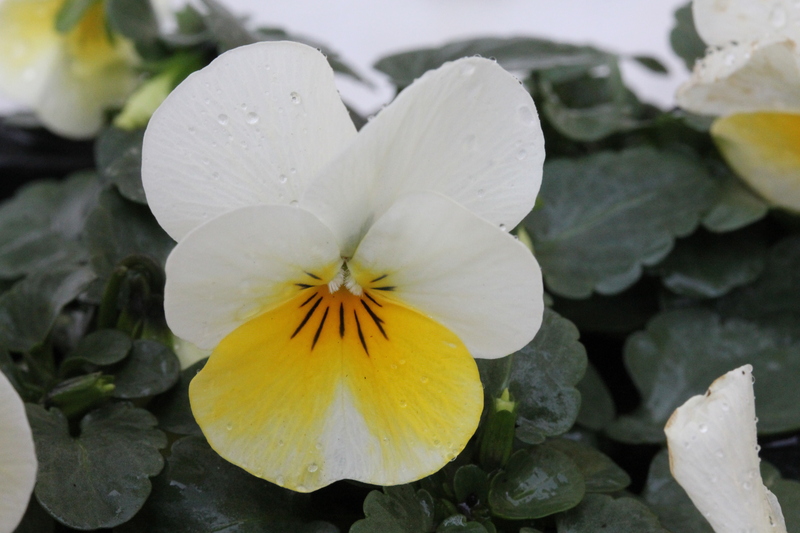 The second one is obvious, the blooms are, pretty much, all white. I have very little white in the garden, not because I don’t like it, but because I don’t like mixing it with other colours (hence my white themed planting in the Grass Bed last summer of just white Cosmos, Malope and Erigeron). What prompted today’s vase was the waft of Sarcococca scent I got when taking my ‘End of Month view’ photos earlier today. The Sarcococca was planted as a tiny specimen and this is the first year it’s been large enough to smell ‘in passing’ (ie rather than grovelling on hands and knees for a sniff!) Consequently, I thought it would be lovely to cut a couple of stems for the house. and some little stems of the evergreen Coleonema ‘Sunset Gold’. This is now a large plant at the top of the ‘lavender’ steps, bought years ago as a good foliage plant. The fact that it also produces such exquisite little star shaped blooms at an otherwise bloom-free time of year is a massive bonus. Like the Sarcococca, I’ve never it picked for a vase before, so I’m not sure how well it will last. Lastly I added a couple of stems of Clematis cirrhosa ‘Freckles’. This is currently providing a veritable curtain across the front of the swing, and although most blooms are either over, or distinctly tatty, a few are still perfect. The photos were taken with flash (something I usually try to avoid), as the light was so poor by the time I’d come inside. However, for once, I like the effect as the flash helps to highlight the white against the dark granite surface. Whilst the vase was put together on Sunday, this morning I’ve really enjoyed having the scent wafting around the kitchen. In fact, bearing in mind how small the stems are, they pack a wonderful perfumed punch and I can’t believe I didn’t think to cut a little sprig last year. I’m not sure how long the scent will last, but as I’m leaving for London again early tomorrow, I’m sure it will see me out! With thanks to Cathy, at Rambling in the Garden who’s sharing a lovely spring display this week and, as usual, hosting all our Monday vases. This entry was posted in In a vase on Monday and tagged Clematis cirrhosa 'Freckles', Coleonema 'Sunset Gold', Leucojum aestivum, Sarcococca confusa on January 29, 2018 by jenhumm116. The Shady Bed is looking good despite the gloom. Here is probably the largest clump of Hellebores and they’re joined by the sweetly scented Sarcococca and the constant Fatsia japonica. Elsewhere, the main view is very gloomy (not helped by timing my photos an hour before some watery sunshine emerged). The Swing Beds are still looking quite full but hardly flowery. Many herbaceous plants still need a cut back, as do the roses, which are looking extremely wild and woolly. The two Clematis cirrhosa ‘Freckles’ are still blooming well on the pergola, but definitely rather tatty on close inspection. And I fear pruning the Rosa St Swithun growing amongst them is going to be a little challenging! More bulbous shoots in the Grass Bed, but as yet no blooms here either. I’ve pruned all the roses in the Mid Century bed, but still haven’t attacked the Salvias. 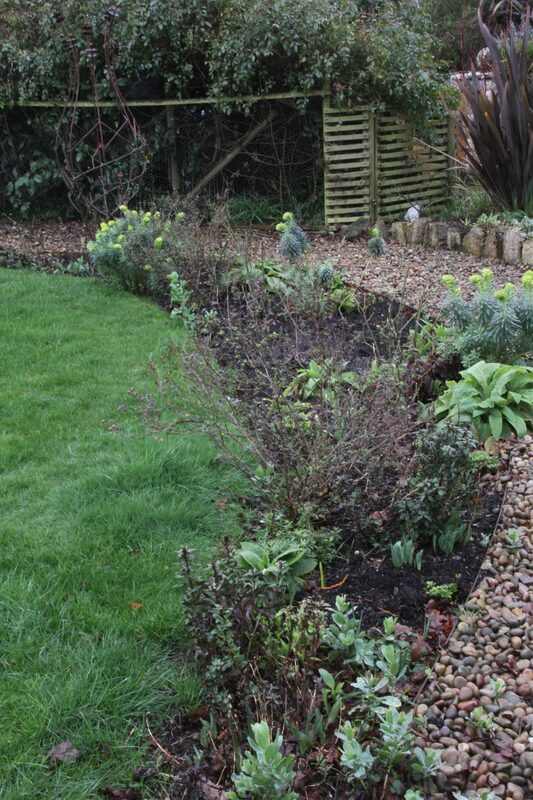 In the foreground you can see some overwintered Antirrhinum which look closer to flowering than some of the bulbs! 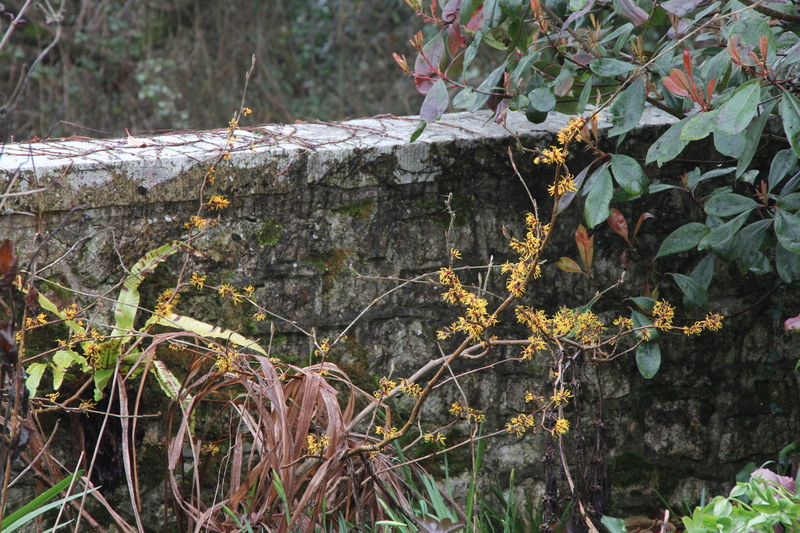 On the other side of the garden in the Oak Bed the Hamamelis (H. Arnold’s Promise) is glowing against the wall. It probably deserves rescuing from all that dead foliage! 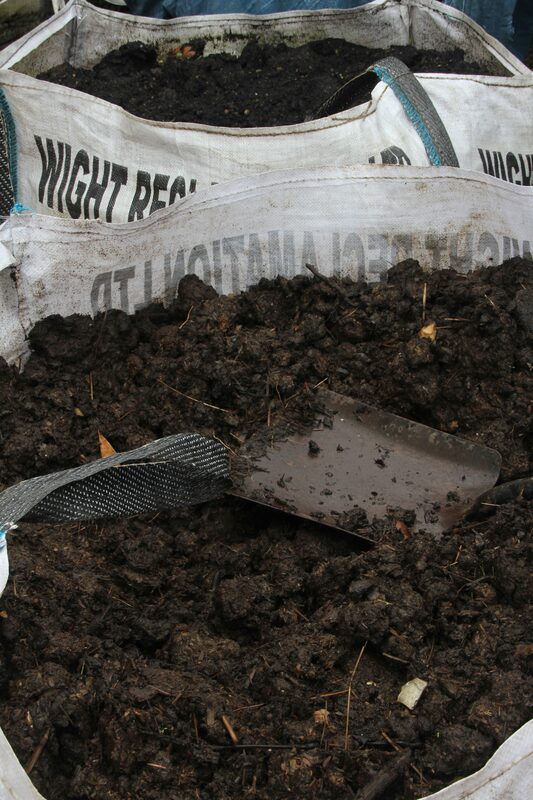 In the Bronze Bed the Narcissi ‘Cragford’ are the furthest advanced of all my daffodils and will soon be ready to ‘pop’. Also ready to pop any minute, my other Hamamelis, H. Aphrobite. Just a couple of blooms so far, but much promise and such a lovely colour. 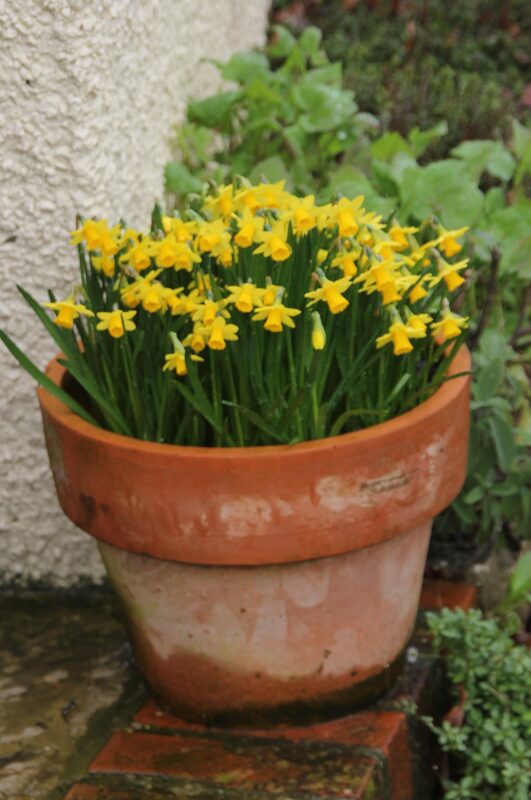 And to finish, you can’t beat a jolly pot of ‘Tete a Tete’. With thanks to Helen at the Patient Gardener for hosting everyone’s EoMV. 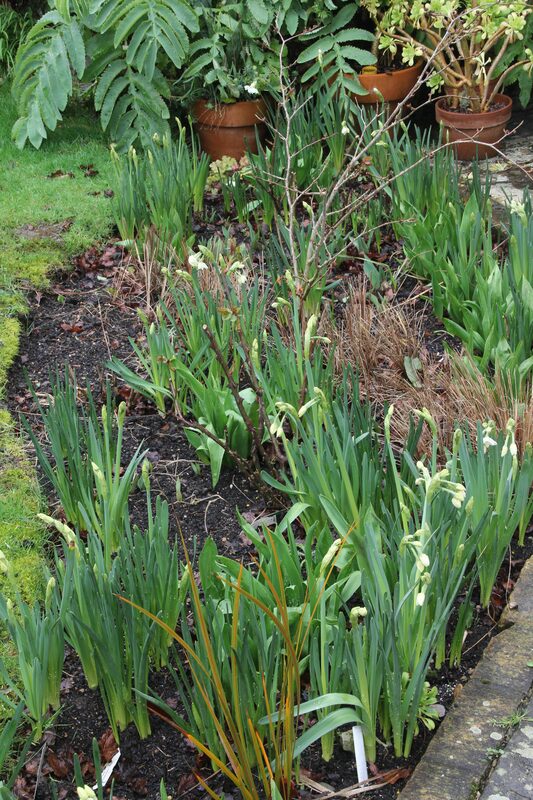 This entry was posted in End of month view, Garden and tagged Clematis cirrhosa 'Freckles', Fatsia japonica, Hamamelis Arnold's Promise, hellebores, Muscari Latifolium, Narcissus 'Cragford', Narcissus Tete a tete, Sarcococca confusa on February 28, 2017 by jenhumm116. One solitary Tete a tete Narcissus to herald this February’s GBBD! 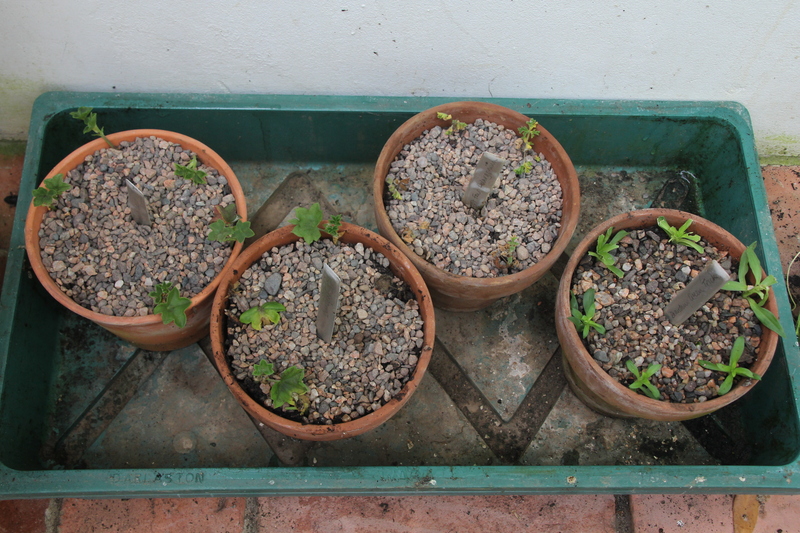 Less yellow and more green, the emerging flower spikes of Euphorbia characias Wulfenii. The joke is that this burgeoning clump is self seeded, whereas the plant I bought and positioned carefully closer to the swing, is a complete wimp in comparison. The pergola is still smothered in Clematis cirrhosa ‘Freckles’ but I have to admit that the recent wind and cold has made the majority of them look rather chewed. I had to work hard to find this one! and this pot of Crocus – Crocus chrysanthus Miss Vain. These have been growing in the greenhouse so now they’re out in the open I hope they don’t get eaten. Wouldn’t be the first time. Grrr. 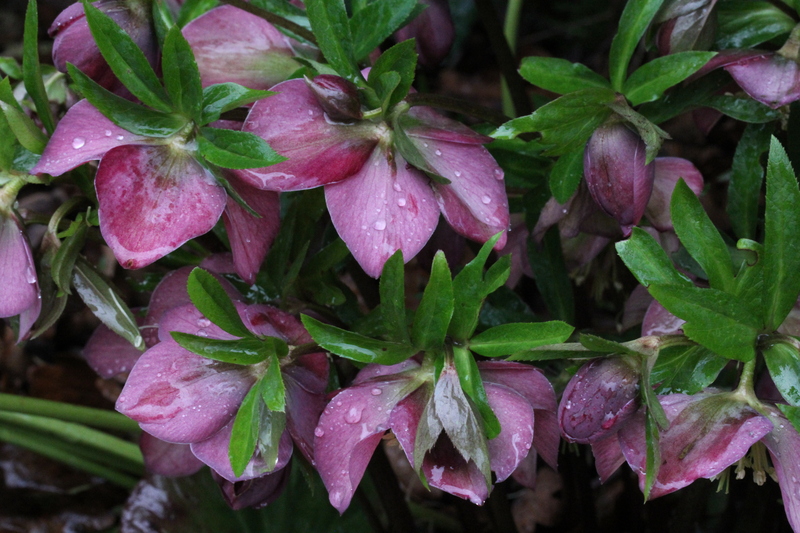 And to finish, a lovely clutch of Hellebores. With thanks to Carol at May Dream Gardens who hosts everyone’s GBBDs. Why don’t you pop over and see what others have blooming now? 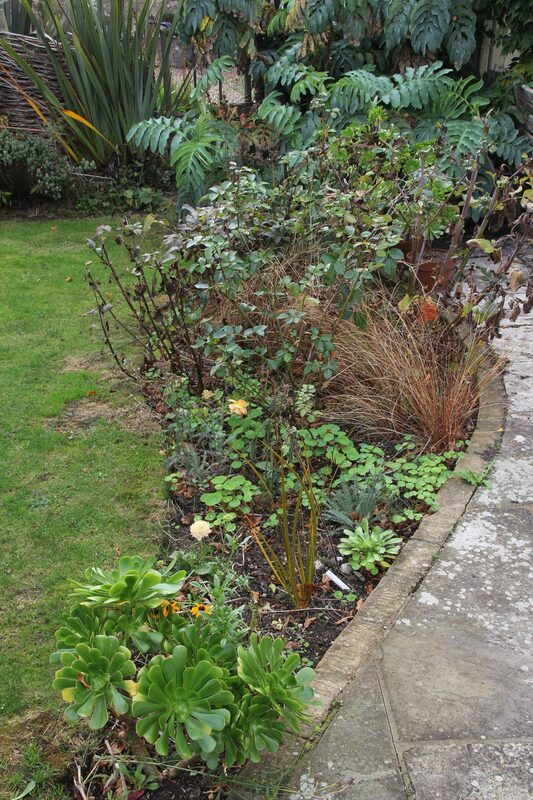 This entry was posted in Garden Bloggers' Bloom Day and tagged Aeonium flower head, Clematis cirrhosa 'Freckles', Cornus mas, Erysimum Ivory Giant, Euphorbia characias Wulfenii, Hamamelis Arnold's Promise, hellebores, Narcissus Tete a tete, Sarcococca confusa, Viburnum tinus on February 15, 2017 by jenhumm116. It’s beginning to look a lot like… autumn. The over the road oak’s papery leaves are just starting to fall and the autumn tints of the Cercis canadensis ‘Forest Pansy’ are showing off the beautiful heart shaped leaves. Elsewhere at this side of the garden my beautiful Dahlia ‘Happy Single Date’ has completely given up the ghost and there’s not much to admire in the Bronze Bed except the wonderful Melianthus major in the background. In the centre you can see part of the ribbon of Carex buchananii grasses grown from seed and planted out this year. 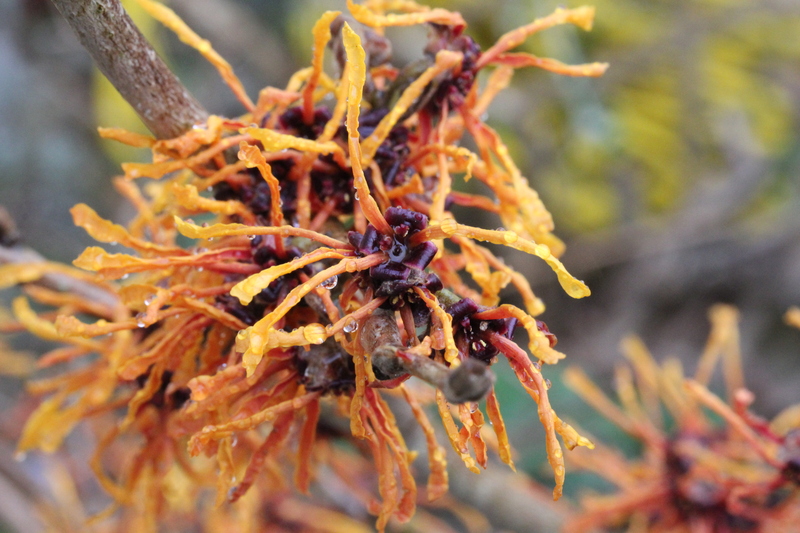 The idea was that they would remain evergreen (ever-brown actually – my mother in law thought they’d died) and provide interest through the winter and combine well with the Hamamelis before the bulbs. It will be interesting to see if this works, or whether they do indeed just look rather dead. Across to the eastern end the Swing Beds are still green but really not very colourful apart from the Salvias. As well as some late colour, after completion of my planting course last year I’d really like to introduce some better structure here. 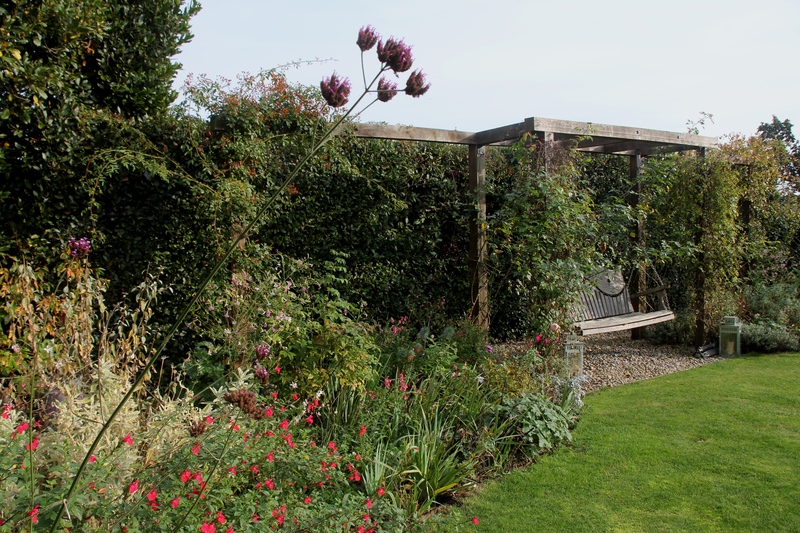 I’d deliberately not planted anything shrubby to the back of the area immediately either side of the swing because I grew sweet peas up netting at the back for a few years. 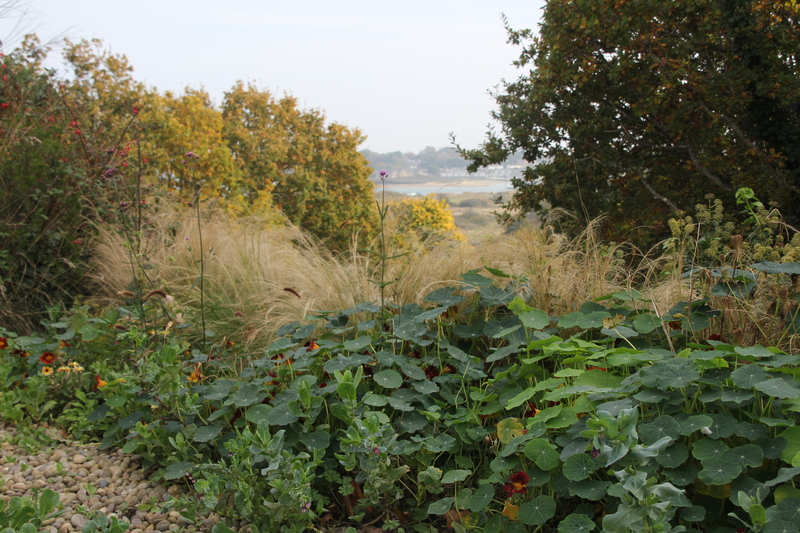 However, they’ve never done that well and so this year I didn’t bother and think the lack of height here – particularly bearing in mind the size of the Phlomis and Elaeagnus further out – is a problem. But what to plant? Hmm. The plan for the grass bed this year was to have a froth of Cosmos and Ammi, but I planted some Calendula along the front edge to cover up the gaps until the other two got going. So where are we now? 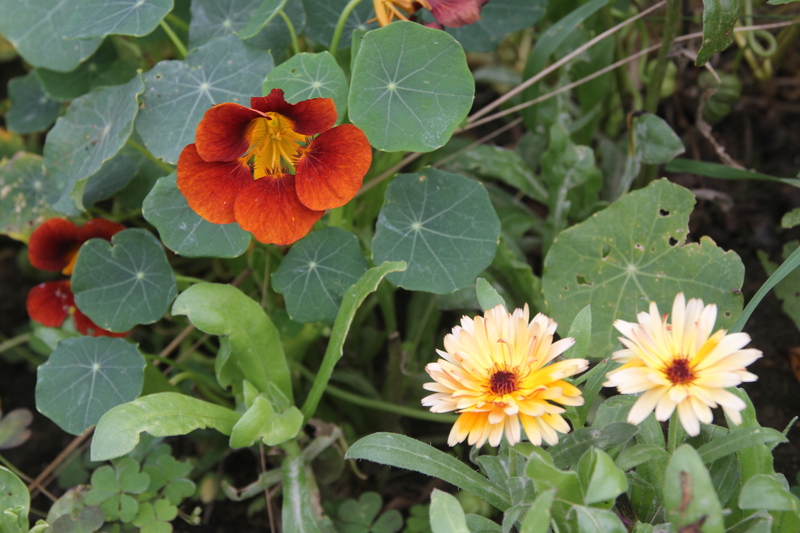 Er, completely overrun with self seeded Nasturtiums! I really must dig these out as I do love the forget me nots in this bed and at this rate there won’t be any. These two make a pretty autumnal combination, but so not the white effect I’d planned! The Salvias are making their mark in the Mid Century Bed too, but I also like the dark Antirrhinums – A. majus nanum ‘Black Prince’ and there are still some dahlias and even roses coming. Plenty of new Cerinthe growth too, with the odd plant actually in the bed rather than the paths! 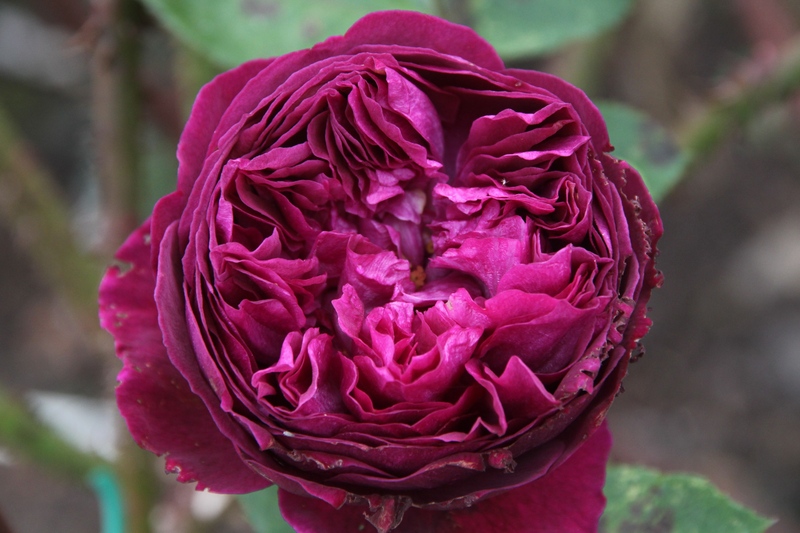 Here’s Rosa ‘Falstaff climbing’ looking a little chewed on the obelisk. 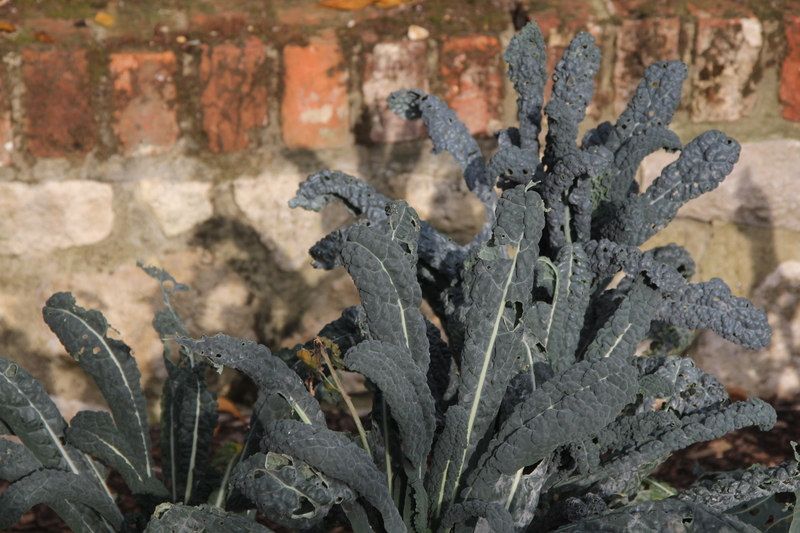 In the Veg Beds there’s not much to see except the Kale. I do love the look and colour of these leaves, and have even used them in arrangements, but they do give a rather cabbagey aroma which is less than ideal! The raised Cutting Beds have been pretty hopeless this year due to lack of water, so rather a shock to see the Zinnias pumping out the flowers now too. To the right of the raised beds you can see the Shady Bed which looks much the same as always except the gradual increase in size of the Sarcococca confusa. This is finally making its mark both in looks now and scent later in the winter. Perhaps I’ll even allow myself to cut a few sprigs next year. but also Winter Sweet Peas, still in the packet as I type, but I can’t wait to see these again come next April! With thanks to Helen at the Patient Gardener for hosting everyone’s EoMVs. 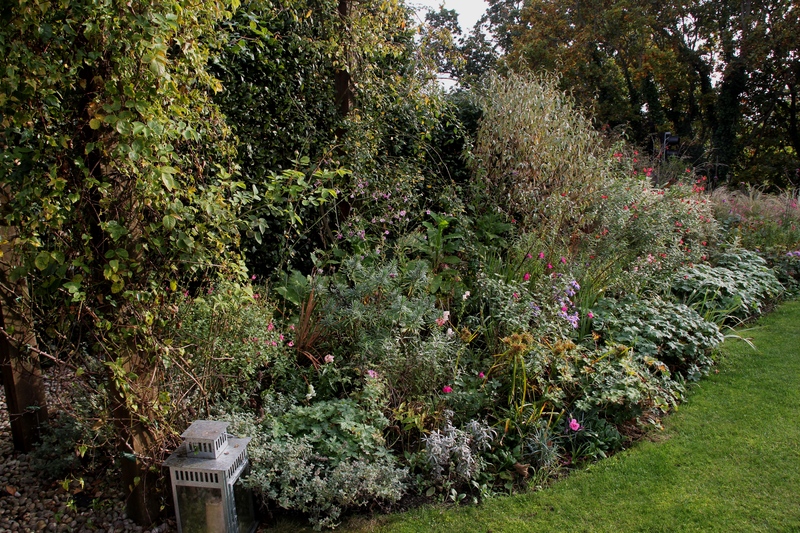 This entry was posted in End of month view and tagged Antirrhinum majus nanum 'Black Prince', Carex, Cercis canadensis Forest Pansy, melianthus major, Rosa Falstaff climbing, Sarcococca confusa, Winter Sunshine Sweet Peas, Zinnia on October 31, 2016 by jenhumm116. Welcome to a sunny End of Month View! Last month’s EoMV, I note was sunny too, but frankly there’s been precious little in between. The lawn is still soggy, and although it has been cut once during the month, it’s only marginally less field like. The Swing Beds are much the same as last month just with some more bulb foliage, as well as plenty of Sisyrinchium striatum leaves. Long standing readers may remember these beds got rather overwhelmed with Sisyrinchium, so I dug them out, only to go on a visit to Mottistone Manor last summer and really admire them there, so I moved a whole lot back. Fickle? Moi? The Grass Bed is also similar to last month, but here, as well as bulb foliage, there are plenty of forget me nots, some of which are just starting to flower. particularly this lovely dark one. Just behind it is a Sarcococca confusa which has finally got big enough for the scent to be apparent without having to scrabble around sniffing at kneecap height! 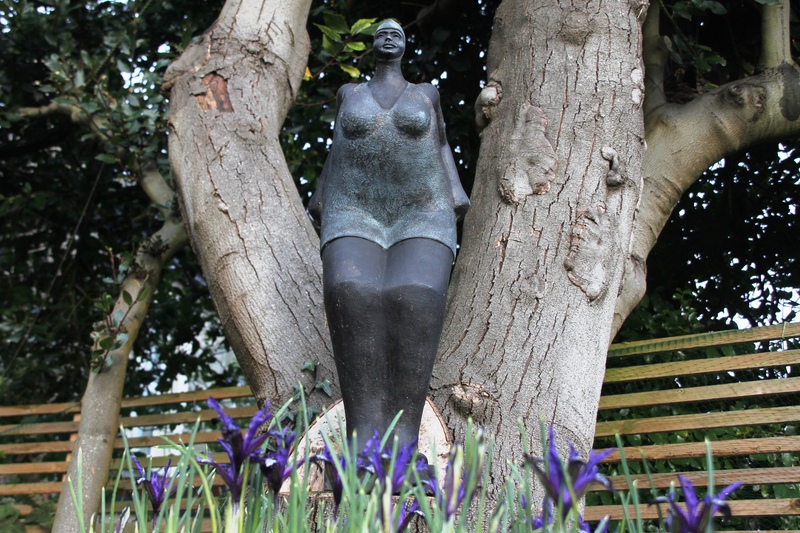 whilst in the Bronze Bed, H. Aphrodite is a little less shy than she was a couple of weeks ago. 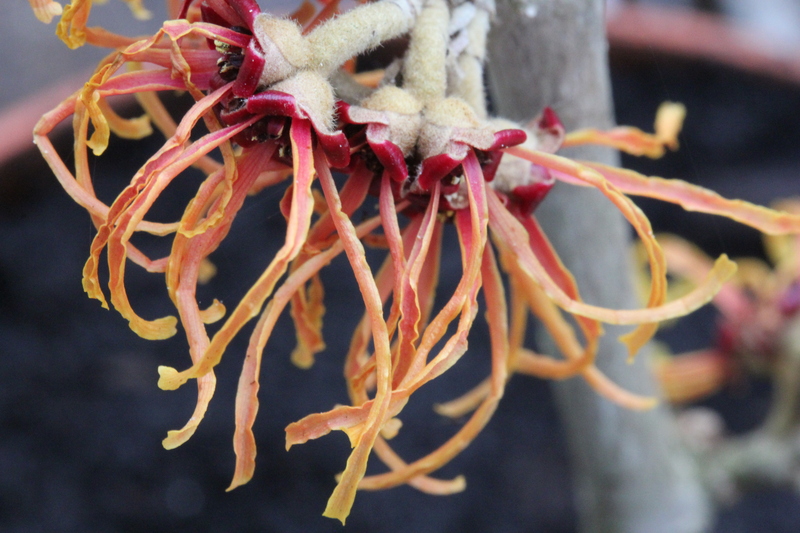 The idea was that the colour of the Hamamelis blooms would be picked up by the trumpet of the Narcissus ‘Cragford’. Well sort of! Along the boundary with next door, is this inherited grass, absolutely glowing in the low light. It’s really time for a cut back, but I’ll for a while longer. Any clues what it is? I’m thinking maybe Miscanthus? 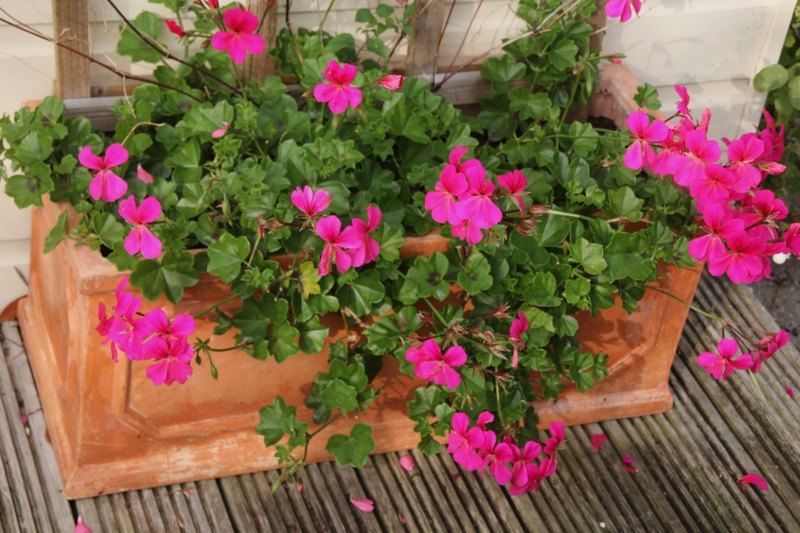 There are plenty of pots around including this new one planted up by the front door. For once I’ve got the Crocuses past the mice. And meanwhile in the greenhouse, I’ve finally planted out my ‘Owl’s Acre’ supposedly early flowering ‘Winter Sunshine’ Sweet Peas. I don’t quite see them flowering in March, as suggested on their website, but I think I have to take a lot of the blame for that. 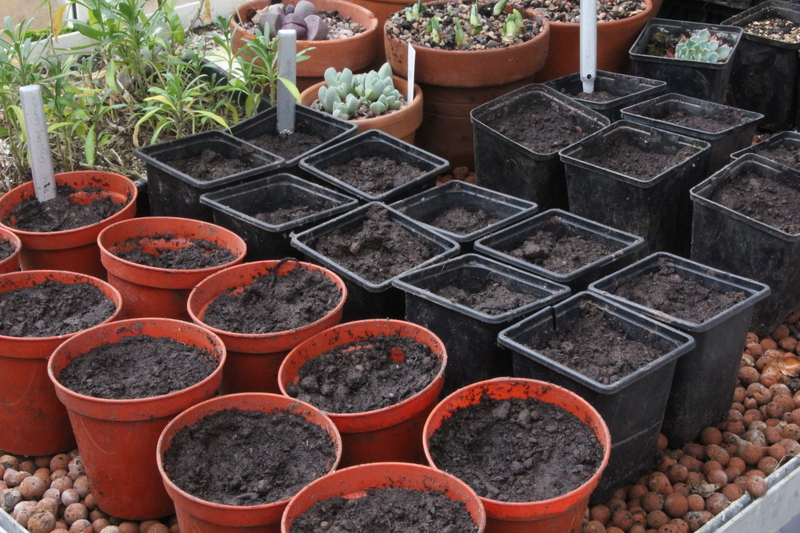 as well as pricking out autumn sown seeds – this time Rhodochiton atrosanguineus, which I’m hoping to have growing up the obelisk again this year. And to finish, a bucket full of N. ‘Tete a tete’ – so cheery! With thanks to Helen at the Patient Gardener for hosting all out EoMV. This entry was posted in End of month view and tagged Crocus Cream Beauty, Hamamelis Arnold's Promise, Iris histrioides 'Lady Beatrix Stanley', Narcissus 'Cragford', Narcissus Tete a tete, Rhodochiton atrosanguineus, Sarcococca confusa, Sisyrinchium striatum, Winter Sunshine Sweet Peas on February 28, 2016 by jenhumm116. 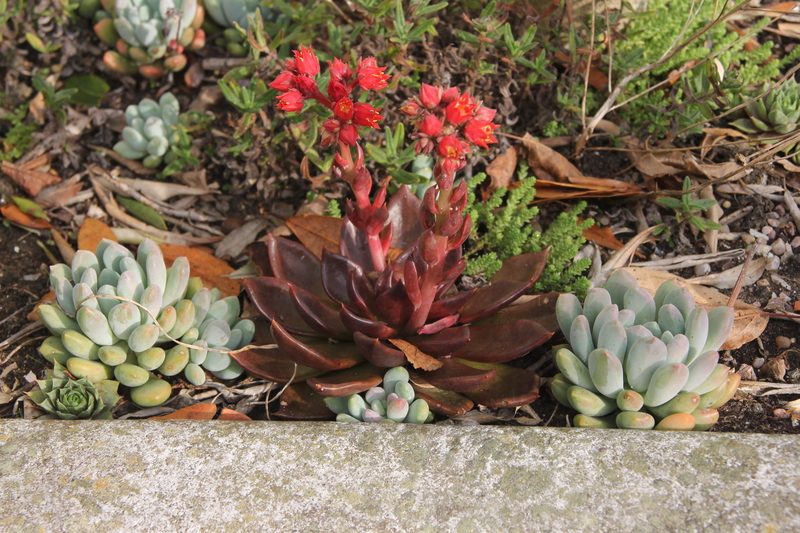 As in January, a strange mix of spring bulbs and rather more exotic plants are blooming. 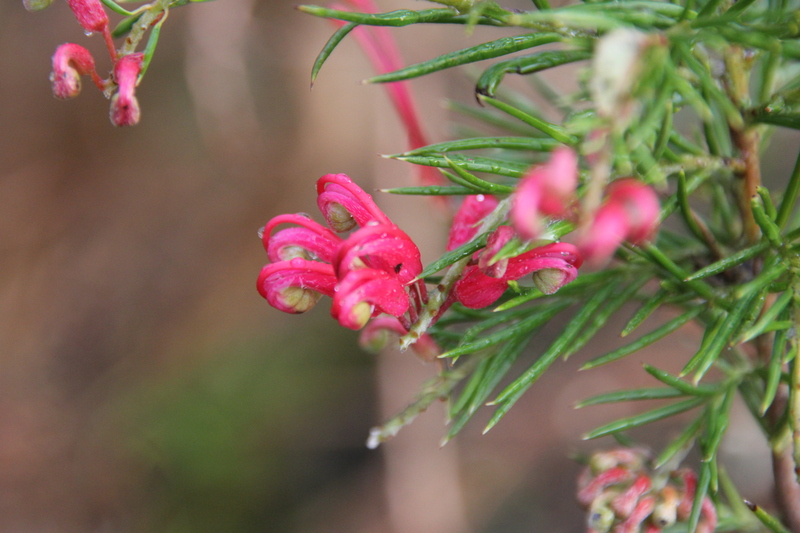 The Grevillea above has a number of genus companions, including this one. 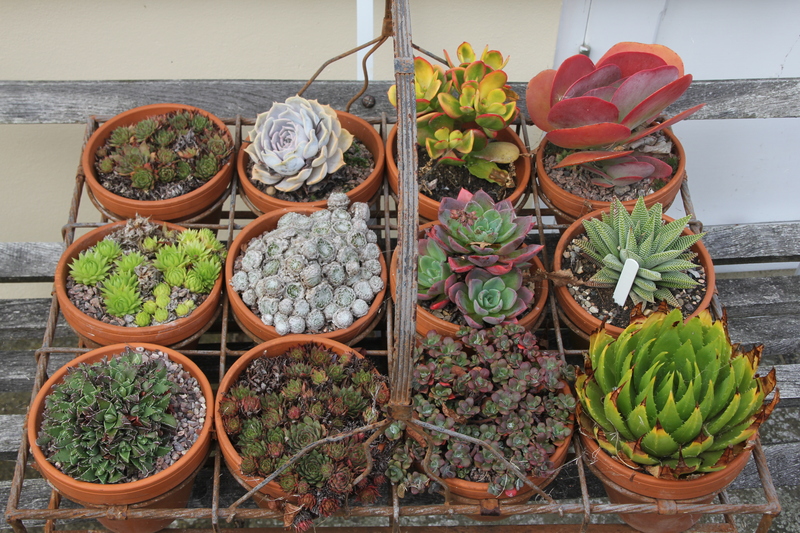 These are both outside, the first in the ground and the other in a pot that’s too heavy and too far from warmth to move. Bearing in mind they’re (largely) Australian, do you think they’re following the seasons down under? 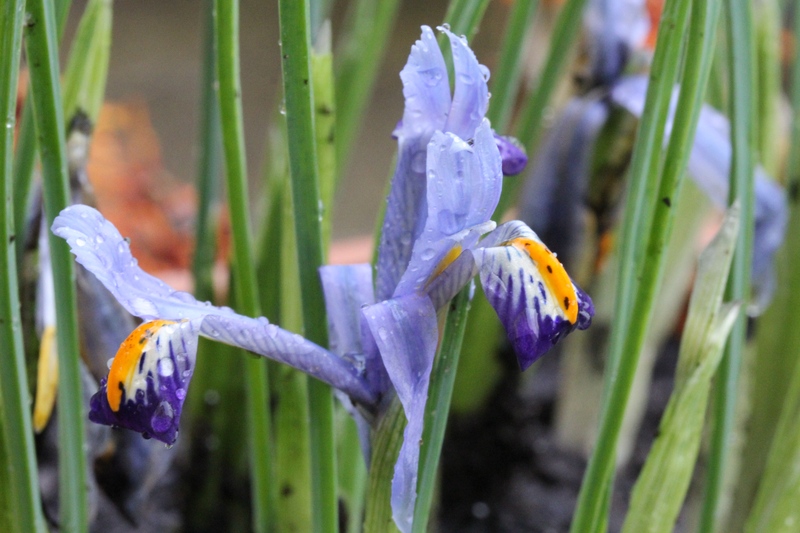 this has now been joined by Iris reticulata ‘Blue Note’, providing an early pool for the Lady Diver. Although why on earth she’d want to be swimming outside this early in the year I have no idea. 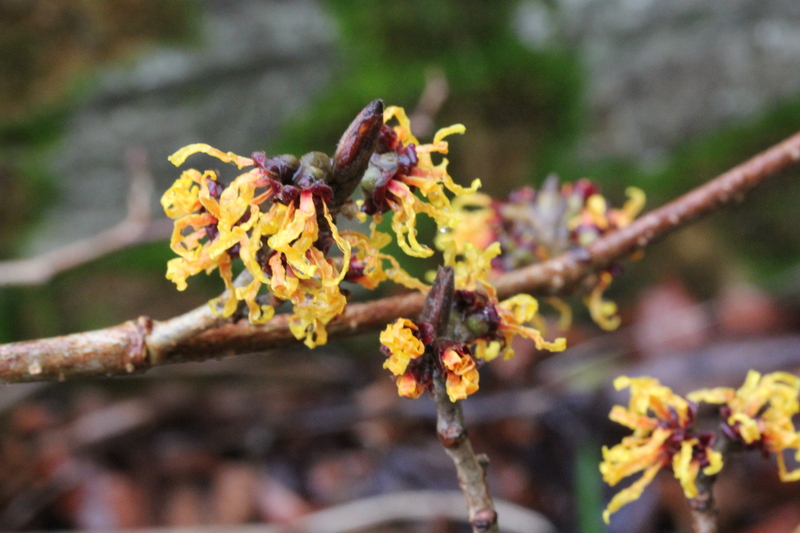 I’m very excited to report that since last month, my Hamamelis count has increased to three. 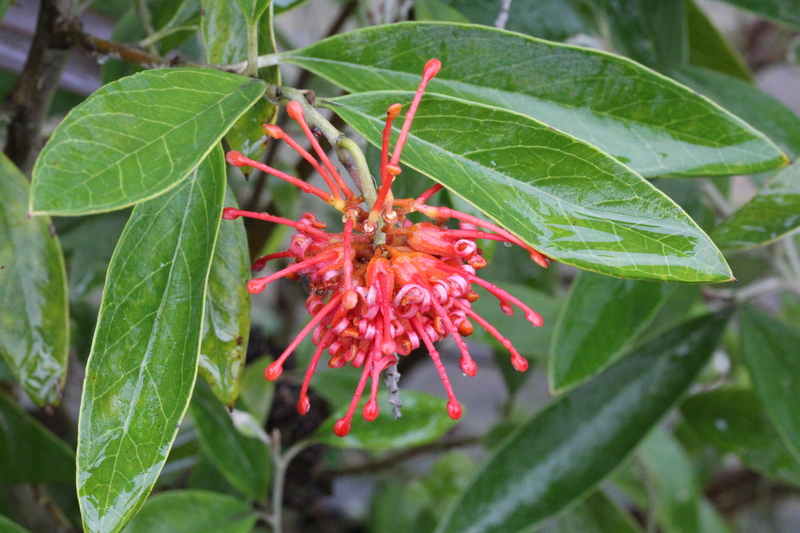 The one below is the one I think is ‘Arnold’s Promise’. 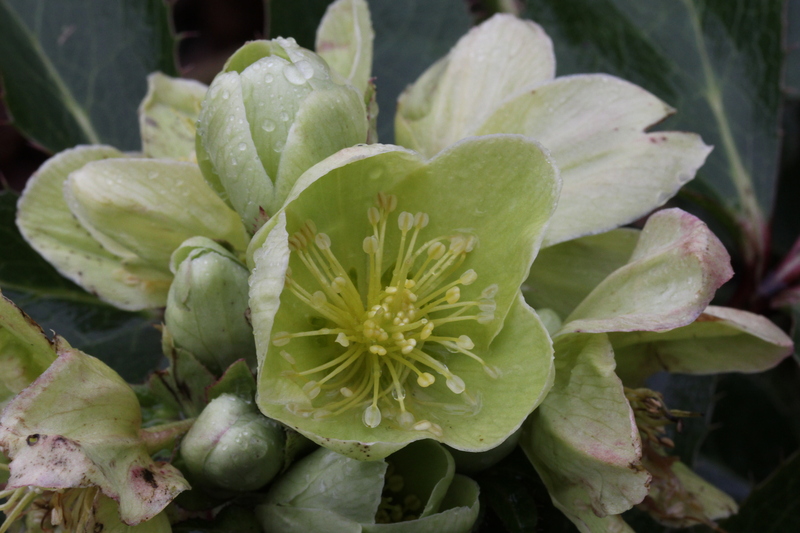 and, as of yesterday’s visit to the Hillier Gardens, a rather more magnificent H. Aphrodite. I’m very chuffed that Aphrodite was my Valentine treat from the OH! 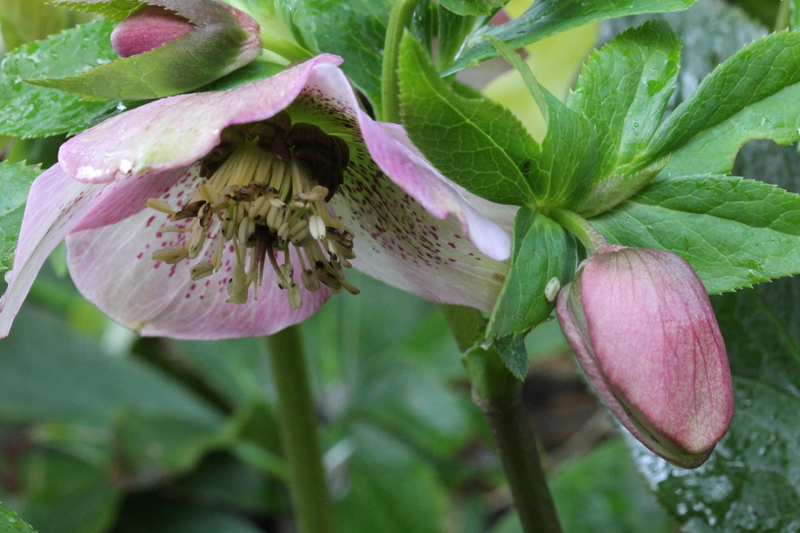 There are more Hellebores blooming, although they’re still not good at lifting their heads. I seem to recall last year the first ones below, in particular, became more erect as the month went on. 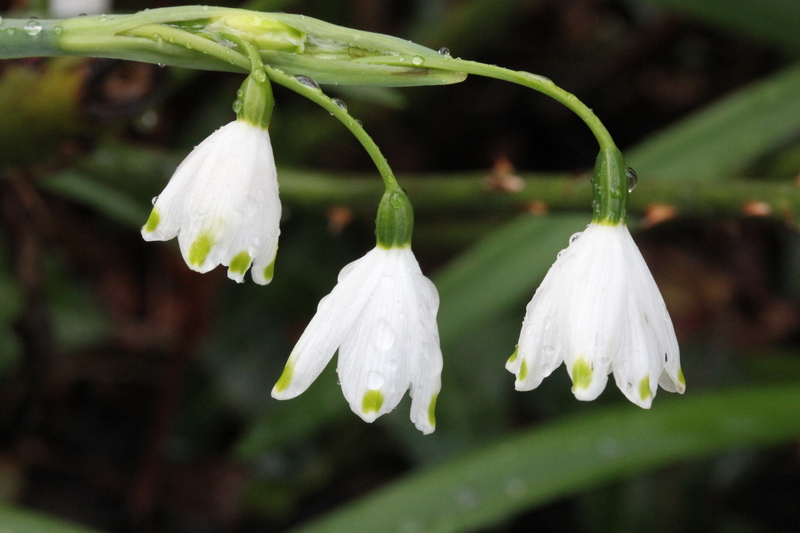 As far as bulbs are concerned, I actually have more of these (inherited) Leucojum than Snowdrops. 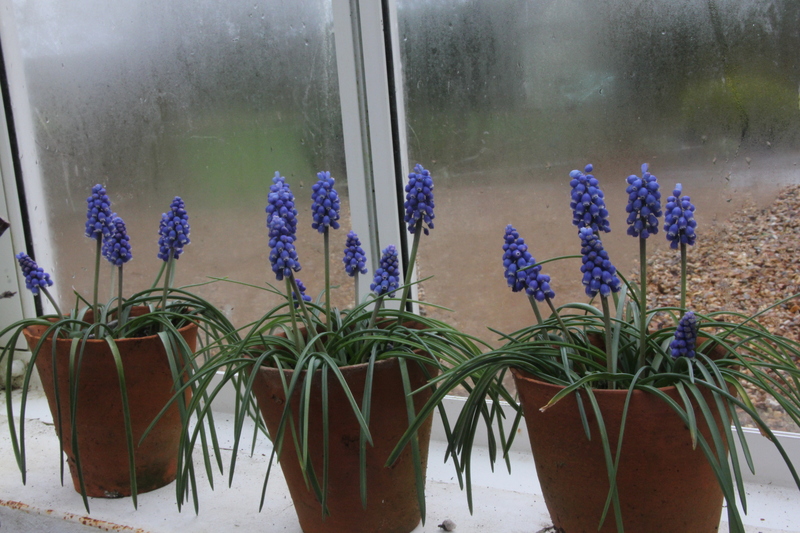 as well as many little Muscari Armeniacum ‘Big Smile‘, planted in pots. 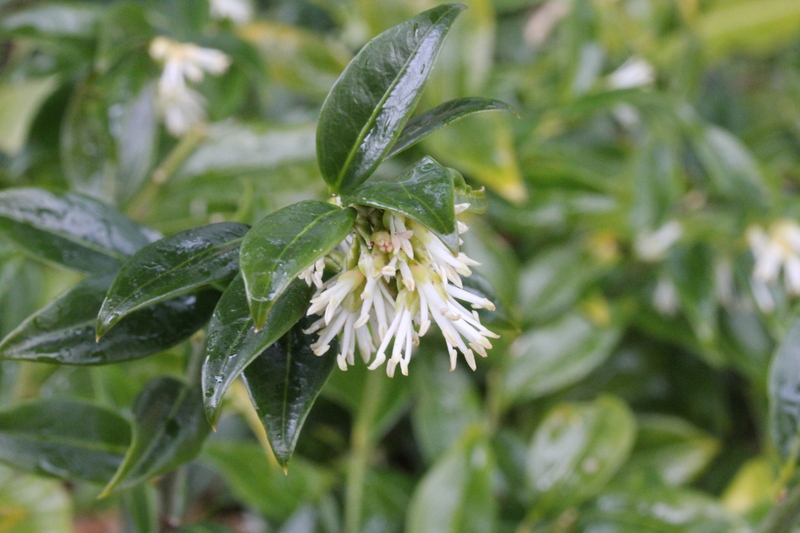 My only real ‘winter interest’ shrub is the Sarcococca confusa. Sadly this is tucked away in the shady bed, thus breaking all the rules about keeping it near the door so you can enjoy the perfume. 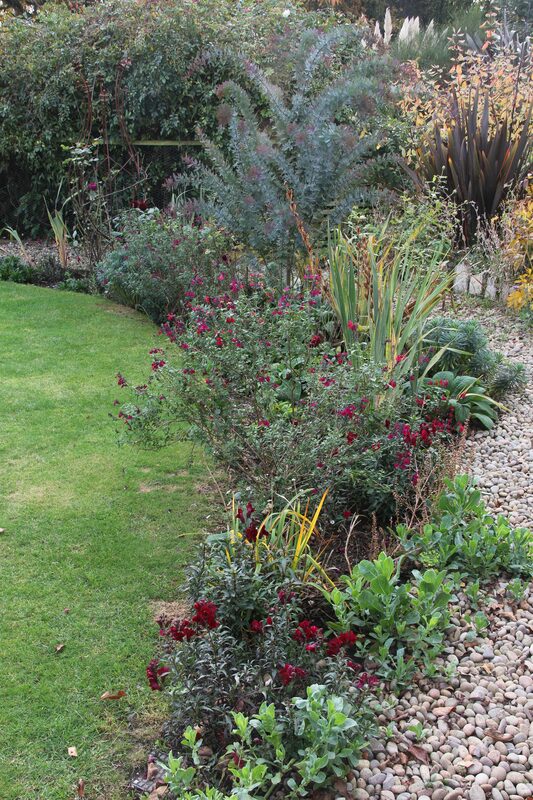 I have been considering digging out a large Phormium (which is near the door) and replacing it with something new for winter interest, but I just can’t decide what would be best. I’m vacillating between Daphne/Lonicera/Viburnum. Any thoughts? 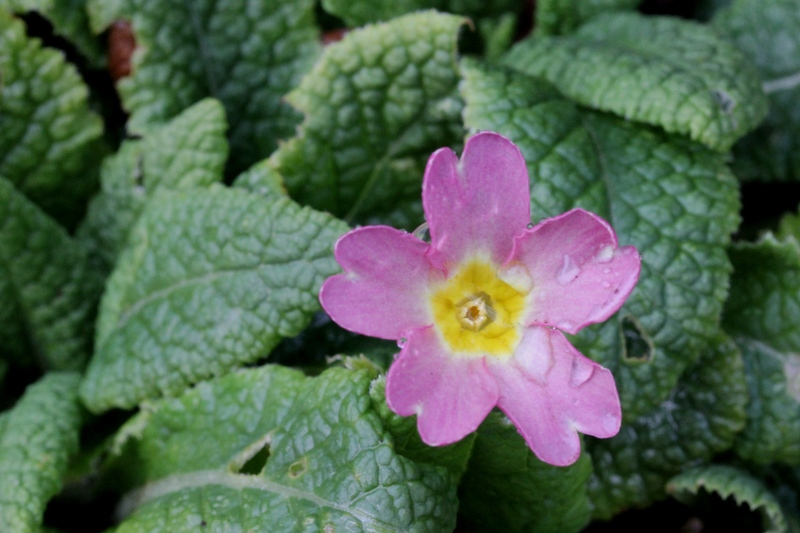 One of my favourite plants flowering at the moment is this little primrose. It is self seeded on the steps which run between the two Lavender Beds. It’s a lovely colour, rather more ‘dusky’ than this picture would suggest. I would love more of it, but I’m terrified to try to dig it up to divide it in case I just rip the plant from the roots (it’s growing in a very small crack). And I’ve never seen any likely looking seeds. And, in case you’re missing the sun, (as I said last month), I give you the following. With thanks as ever to Carol at May Dreams Gardens who hosts the GBBD. 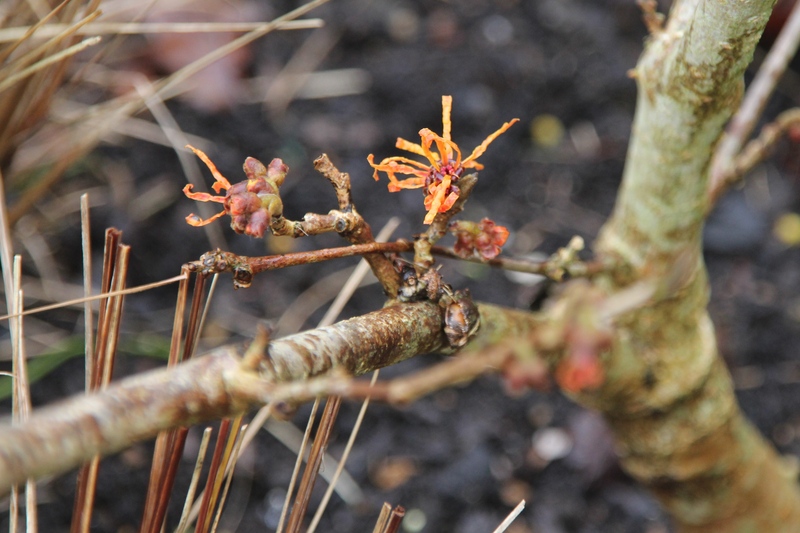 This entry was posted in Garden, Garden Bloggers' Bloom Day and tagged grevillea, Hamamelis Aphrodite, Hamamelis Arnold's Promise, Hamamelis Jelena, hellebore, Iris reticulata 'Blue Note', Iris reticulata 'Gordon', Leucojum, Muscari Armeniacum Big Smile, Sarcococca confusa, Viola Sunny Side Up on February 15, 2015 by jenhumm116.